See, I knew that post title would catch your eye. No sign of The Hedgehog anywhere, I assure you, this post is staying strictly above the belt. We had a Movie Night at home a while back, to have an Alien/Aliens movie marathon after the Mister bought the super-duper Blu-Ray DVD combo that went on mega-sale when Prometheus came out. I can't say much for Prometheus, quite frankly friends who saw it said it kinda sorta suuuuuuuucked, but that shouldn't diminish the chest-bursting awesomeness of the previous films (well, the first two) and the fact that I just wanted an excuse to make grownup snacks like Gummi Whiskey Colas and bacon caramel popcorn. Let's all go to the movies! 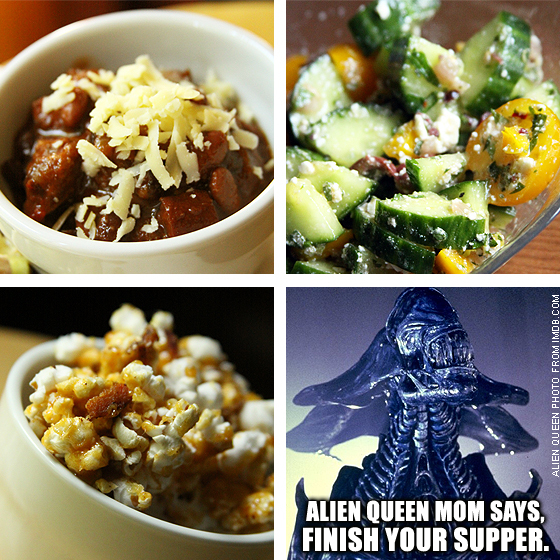 WARNING: MOVIE NERD ALERT -- What prompted this post was less Prometheus, more a revisit of the previous Alien/Aliens movies because the Mister bought the fancy-schmancy BluRay set. The fact that the DVD movie set didn't include any of the Alien vs Predator (AVP - sigh...) movies was a blessing; I don't count those as part of the Xenomorph Mythology. It included the arguably good (I liked it) Alien 3, one of David Fincher's first full length features, pre-SE7EN, and the bizarrely squishy acid trip that is Alien Resurrection, which had the benefit of French director Jean-Pierre Jeunet of Delicatessen, City of Lost Children and Amelie fame. But great directors aren't enough to improve goofy scripts and the fact that it's hard to sympathize with a prison colony full of mysogynists -- chow down, hungry Alien. But I will say, the best thing about this DVD set was the fact that you got the extended cut of Aliens. Before James Cameron got all googly-eyed over the Titanic and made Dances With Aliens, I mean Avatar, he did an amazing job with reinventing Ridley Scott's original Alien into a wicked roller coaster ride. The director's cut adds quite a bit more exposition and additional dimension to key characters; it definitely kicks the badassery of the original up a few notches, so if you're as much of a supernerd about the Alien/Aliens movies as I am, it's a worthy DVD set to add to the collection. OK, Movie Nerd Rant over. Clearly, I take my movies seriously, so I put equal effort into Movie Night. Not that these movies elicit any gastronomic inspirations, short of making spaghetti and everyone losing their appetite the second you see John Hurt have the worst case of heartburn in the history of man. 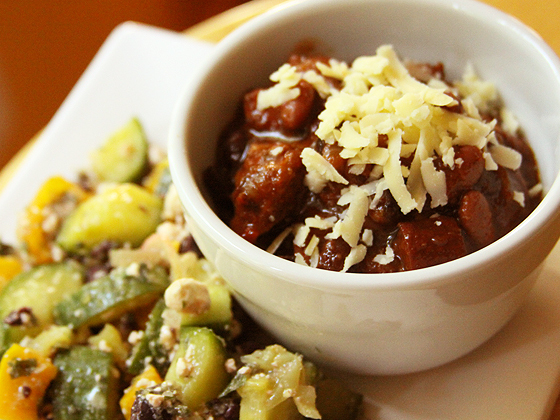 Since we had a group of people over, I went the easy route: a large crock pot of chili. Nothing fancy, the pot stays hot and people serve up what they want. I had a cold antipasti-like salad as a side and it was all a hefty base to cushion the snackery I had prepared earlier. 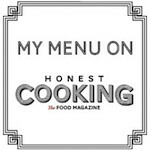 Caramel bacon popcorn was of course inspired by Lisa Dupar and her crafty food wizards at Pomegranate. 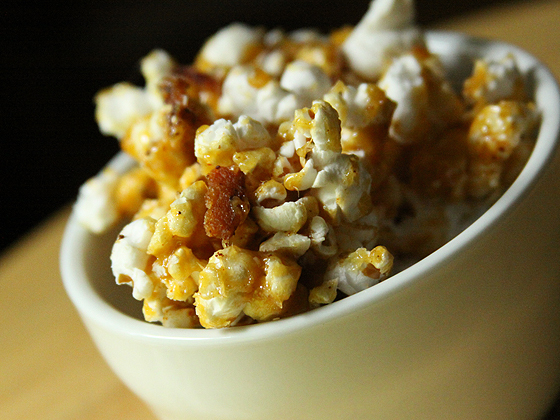 I still had visions of my last visit to Pom Bar dancing in my head, so I thought crumbles of crispy bacon tossed with freshly-made caramel corn would be a fitting savory snack to accompany our action-packed movie night. 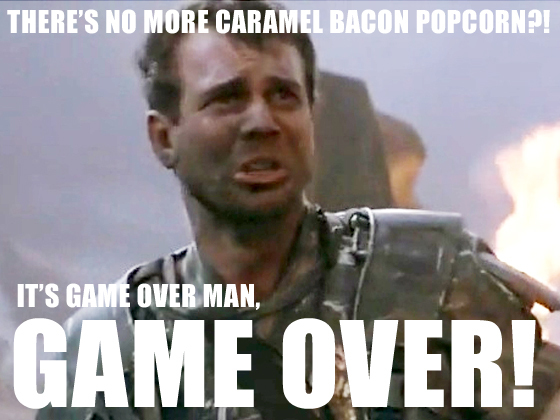 Plus it's something you can make ahead -- I made several batches of the bacon caramel corn a couple of days before the event and kept them stored in sealed plastic bags. Even with a little humidity in the air, the caramel helps keep things crunchy. But of course the most curious snack to be given an R-rating was drunk gummi candies. 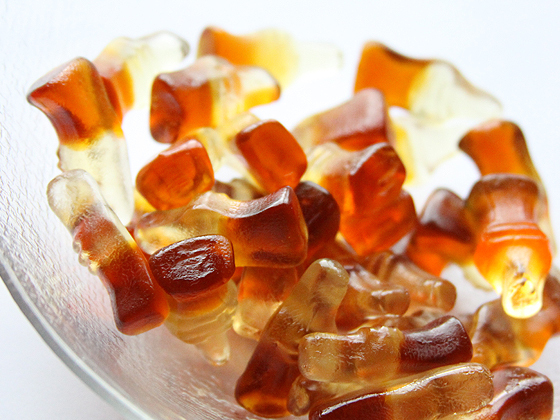 I can blame/thank Serious Eats for this one, they posted a story about "Rummy Bears" and that of course got me thinking about my favorite gummi candies, gummi colas, and how awesome it would be to soak them in whiskey. That should be a solution to any tough problem. Got an issue? Have some whiskey. Problem solved. whiskey gummi cola?!?! genius! great addition to vodka gummi bears...aka portable jello shots.